Ann Arbor Needs Condo Listings! Ann Arbor Condo sales finish off the year strong with 586 closed listings recorded from December 2012 – December 2013. However, listing inventory continues to decline with only 112 condos listed for sale, the lowest level for the year. Compared with December 2012, listings are down 17%, and when compared with December 2011, listings are down 46%. All price ranges are in a seller’s market, with the overall condo market at a 2.3 months supply of units available. The $500k – $1M price range had 4 closed sales in December and is now in a seller’s market for the first time this year. Sales have remained steady throughout the year, despite the lack of inventory. This is an indication that there are a large amount of condo buyers out there, even though interest rates have gone up slightly. What does this mean for an Ann Arbor condo seller? This is the perfect time to list your condo for sale! Avoid the competition and don’t wait for the busier spring market, as a lot of sellers are doing. 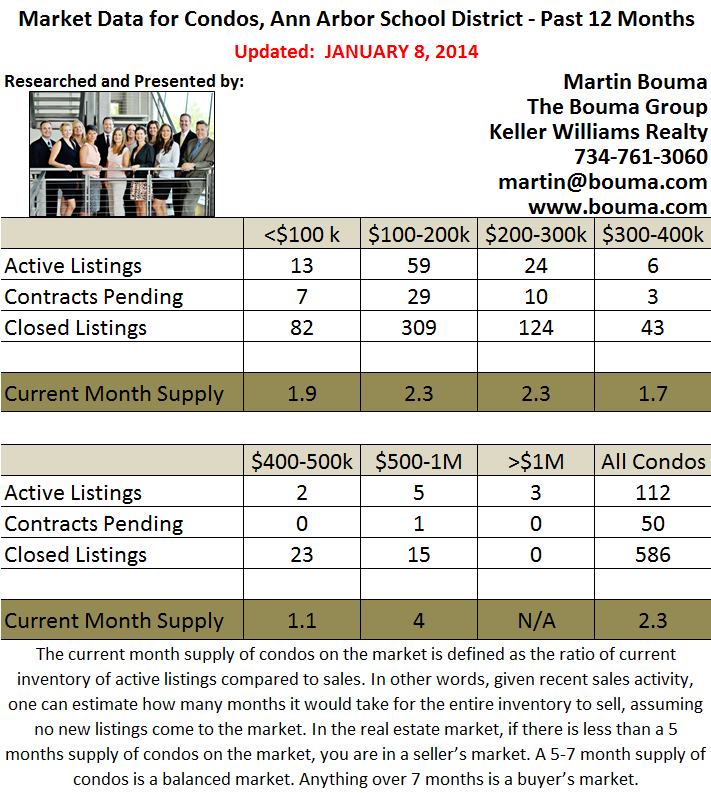 To find out what your unit is worth in today’s market, contact us at The Bouma Group at 734-761-3060 or info@bouma.com. We’ve been Ann Arbor’s #1 seller of condos for the past 16 years and know the market better than any other Realtor!